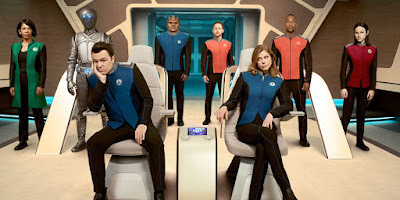 Some Thoughts About "The Orville..."
So my wife and I have watched the first five episodes of "The Orville," by Seth MacFarlane. I have thoughts. Here they are. "The Orville" is a show about the adventures of a starship's crew. The ship belongs to a Union of Planets, which is administered by a series of admirals and has a naval command structure. Their mission is to explore the galaxy and render aid when needed. They have a stoic second officer whose culture is vastly different than most of the people on board, as well as an android who struggles to comprehend human peculiarities. The ship travels at faster than light velocities, and features a holographic entertainment room and a matter replication system. 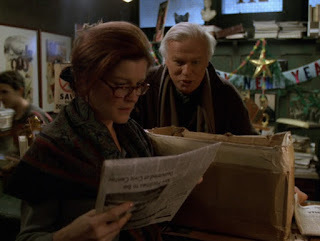 While exploring her family's history, Janeway discovers a new story regarding a relative she has looked up to her whole life. One of the many scintillating scenes in this episode. Newspapers! Messy book shops! Seven of Nine seeks out the Doctor's assistance as she explores the notions of dating and romance. Oh, look! All they had to do was take down her hair and remove her glasses, and now she's Homecoming Queen!